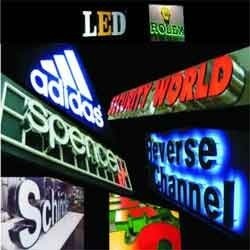 At Lakshmi Signtech, we are constantly engaged in bringing out a huge range of Channel Letter With LED. We offer these products as per latest technology and saves your cost upto 80%. Our low priced products guarantee high work and are sure to delight any business from large to small. These letter look extremely attractive once they start laminating and shining especially in the dark and can be seen from distance. We manufacture technologically superior and splendidly engineered Channel Letter With LED and we also provide custom SS channel letter with LED. Outstanding features of our SS channel letter with LED are rich design for low maintenance Wide variety of models to suit all needs high durability and long life guarantee meeting all safety and quality standards. Looking for Channel Letter with LED ?